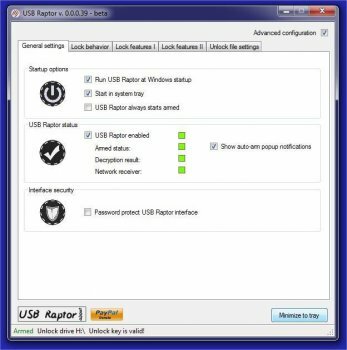 USB Raptor can lock the system once a specific USB drive is removed from the computer and unlock when the drive is plugged in again to any USB port. The utility constantly checks the USB drives for the presence of a specific unlock file with encrypted content. If this specific file is found the computer stays unlocked otherwise the computer locks. To release the system lock user must plug the USB with the file in any USB port. Alternative the user can enable (or disable) two additional ways to unlock the system such is network messaging or password.